For most of season two of Star Wars Rebels, it was hard to miss the signs that things were building towards an explosive conclusion. Not only was it explosive, but the season two finale shook things up in a major way. What looks (no pun intended) to be the biggest game changer is Kanan being permanently blinded after his duel with Maul. Granted, it’s entirely possible this injury will be fixed by next season (after all, medical technology in the Star Wars universe is capable of some pretty amazing things) but I’m hoping that it stays permanent. For one, it would be especially great on the representation front to show that physical limitations don’t mean you can’t still be a hero. But secondly, it presents the perfect opportunity for a fun nod back to the Legends timeline. If Kanan is going to learn to cope with his newfound blindness, he’s going to need help. He can manage for the time being through intense concentration in the Force, but he probably won’t be able to maintain that level of concentration 24/7. And that’s where the Miraluka come in. Readers familiar with the show Avatar: The Last Airbender will remember Toph, the blind Earthbender introduced in season two. Though blind, she is still able to “see” via her Earthbending because she can sense vibrations; as a result she is far stronger and more in touch with her innate Earthbending abilities due to relying on them in the absence of physical sight. She provides an excellent example for Rebels. Kanan finds himself in a similar situation…and fortunately in the Star Wars universe there’s already a whole species who use their Force sensitivity to compensate for a lack of sight. We have already seen that one of the most fundamental skills Jedi learn is how to use the Force to overcome lack of sight. And it’s solely thanks to that training that Kanan was able to survive his duel against Maul. But it’s not something that comes naturally to him, especially in the heat of battle. He’ll need to become more deeply attuned to the Force than he was before if he wants to develop Force sight. And what better way to get that training than for the Ghost crew (or maybe just Kanan and Ezra) to cross paths with a Miraluka or two? 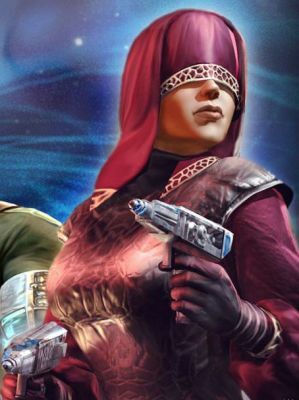 The Miraluka, for those unfamiliar, are a species which first appeared in the Old Republic era of Star Wars Legends. They appear almost entirely human with one exception: they lack eyes and are therefore born physically blind. Instead, they are deeply attuned to the Force and through the Force are able to “see” the world. Obviously Kanan, who has relied on physical eyesight for however many years, would have a harder time reaching that level of proficiency but a season long character arc of him learning to adapt to his circumstances and become more deeply attuned to the Force would be fascinating to watch. It would be a chance to explore more of the Force. Usually when the franchise dives into the more mystical aspects of the Force, it’s pretty much all prophecies and visions and Force ghosts. And while those things are definitely cool, we rarely get to explore the “everyday” aspect of the Force, i.e. focusing on the present and seeing the connections that bind living things together. That’s essentially what the Miraluka do, and having a Miraluka character pass this knowledge and training on to Kanan would be a cool way for the audience to explore the Force more deeply as well. And, frankly, just think of the cool animation we’d get in return. In Avatar, we got to “see” how the world looks to Toph when she sees with Earthbending. What does the world look like to a being when viewed through the Force? On a purely visual level, there’s a chance to have a lot of fun here. And finally, it adds to the diversity of the Star Wars universe. The galaxy is a HUGE place, and there’s a multitude of alien species out there. While Miraluka are not physically that different from humans, their uniquely Force-sensitive nature sets them apart and adds to the overall lore and tapestry of the GFFA. The more diverse you can be when creating your setting and characters, the richer the story will be. The Miraluka are (to me) one of the more interesting species in the Star Wars universe and Rebels has created the perfect opening to bring them back into the new canon. Not only would it be a fun nod to the fans, but it’s great chance to enhance and deepen what we know of the Force. Not only that, but the (re)introduction of new alien species in the current canon continues to flesh out the Star Wars universe and diversifies the setting. 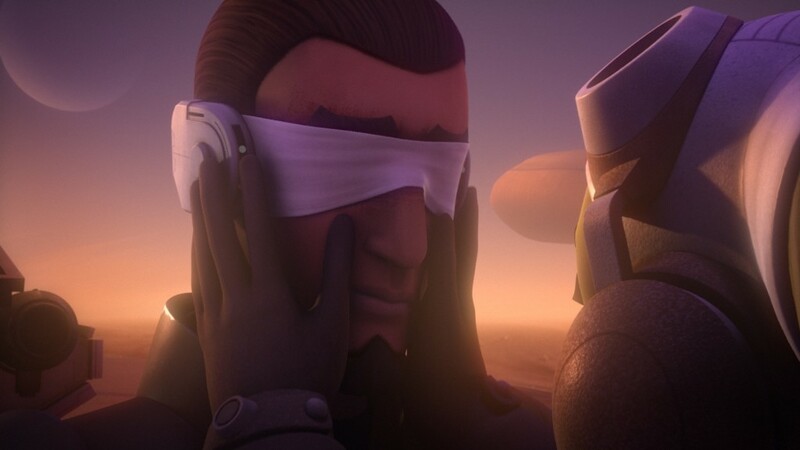 And plus, if the Rebels team is serious about wanting to have a physically blind hero, then Kanan’s got a lot of character development ahead of him as he learns to cope with his new physical limitations. And who better than a physically blind Force-sensitive to teach Kanan how to see through the Force and make peace with his limitations? Kanan’s final fight scene with Maul at the end of Season 2 is right out of an old Zatoichi movie. I agree that there is plenty of “blind warrior” material for them to work with. How much of a bummer would it be if Season 3 begins with him getting his Geordi-La-Forge-First-Contact eyes?